A whole house fan is a fan that is installed into the attic of a home. It draws in the hot still air that is in the home and pushes it into the attic. While the fan is on, the windows in the house are open, causing cooler air from the outside to replace the hot air that is being pushed into the attic space. The use of whole house fans in place of an air conditioning unit is effective when the air inside the home is warmer than the outside air. Whole house fans are a very cost effective way of cooling a home. Often reducing energy bills by as much as fifty percent. There are two main types of whole house fans, ceiling mounted and ducted. Ceiling mounted fans are just as the name sounds, mounted to the ceiling between the attic and the actual living area. Ducted fans are not mounted to the ceiling but remotely away from the ceiling. They are usually quieter than ceiling mounted whole house fans, but the ceiling mounted fans are still more popular. 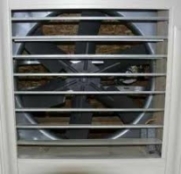 There are several companies that manufacture whole house fans. Some on the list are Airscape Whole House Fans, there claim is to "stretch your energy dollars without sacrificing comfort." There is also Tamarack Technology, they specialize not in just whole house fans, but other fan types including ventilation fans. Another manufacturer is LL Building Products, they are the manufactures of the Tandem whole house fan. The Tandem fan is often used in place of an air conditioner, having two motors and coming with a two speed remote control. Choosing the fan that is right for a specific house really is not difficult. A couple of things to take in to consideration is the size of the house, that will help determine what size of fan you need. Then deciding if it is to be ceiling mounted or ducted mounted, again while the ducted mounted is usually quieter, the ceiling mounted is still more popular. Installation can usually be a do-it-yourself project, however, making sure that ventilation in the attic is sufficient is a must because the air that is being pushed up into the attic must be able to return outside. As long as the ventilation in the attic is of the same size as the shutter hole in the ceiling there should be enough venting.